Similar to this year's mind-bending indie hit "Memento", the 2000 South Korean film "Peppermint Candy" starts at the end of the story, and gradually works its way back to the beginning. However, whereas "Memento" was a revenge thriller spanning a mere two weeks, the ambitious canvas of "Peppermint Candy" covers two decades of recent South Korean history, with its contemplative and poignant tale of innocence lost, echoing the social, political, and economic turmoil of a nation's arduous climb to democracy. Of all the films to have sprung from the recent renaissance in Korean cinema, "Peppermint Candy" is perhaps one of the more substantial ones, easily making this South Korean-Japanese co-production a modern classic. ... which he does, in a way, as the story jumps back three days before, filling in the holes as to who Yongho is and why he ends up killing himself. Unfortunately, Yongho is not in much better shape-- he has lost all his money to a stockbroker, he is heavily in debt with a loan shark, and his wife has left him. With his last bit of savings, he has purchased a handgun to put himself out of his own misery. However, before he can do so, he learns that his first true love, Sunim (Mun So-ri), is on her deathbed, and he has been asked to see her one last time. The story then continues to jump back through time, gradually revealing more about Yongho, his relationship with Sunim, and the circumstances that end up unraveling the tapestry of his life. As the story moves back through Yongho's life, director Lee Chang-dong segues each segment with film of a train moving backwards. In addition, the action of each segment prominently features railroad tracks and a passing train, emphasizing that each of these vignettes comprise the same thread of history, permanently linking Yongho's past with his destiny. The next stop is 1994, where we find Yongho juggling his small business, his unhappy marriage to Hongja (Kim Yejin of "Girls' Night Out"), and an affair with his one of his employees. A chance meeting in a restaurant, where Yongho runs into a figure from his past, then leads into the film's next sequence, set in 1987. In this time period, Yongho is a policeman who is willing to use any means necessary, including torture, to extract confessions from government dissidents. In addition, Hongja is pregnant with their daughter, and it is already apparent that the seeds for the marriage's dissolution have already been sown. When we catch up with Yongho in 1984, he is a rookie cop who ends up being traumatized when he beats his first confession out of a suspect. But the defining moment for Yongho comes in 1980, when as a soldier, his unit is called on to quell a civil disturbance and he ends up accidentally shooting an innocent bystander. When the film reaches its end at the beginning of the story, the year is 1979 and the setting is the same riverbank seen at the beginning of the film. The picnickers are twenty years younger, and among them are Yongho, a young man full of hope and innocence who aspires to be a photographer one day, and the love of his life, Sunim. Unfortunately, because of what has come before this, we know that none of his dreams will come true, the love of his life will slip through his fingers, and he will end up a tragic figure, lonely and heartbroken on the same riverbank twenty years later. In many respects, "Peppermint Candy" has much in common with "Forrest Gump". Similar to how the titular protagonist of the 1994 Robert Zemeckis film was a stand-in for the American people and his adventures through history reflecting the experiences of the Baby Boomer generation, Yongho is a stand-in for the South Korean people, with his degradation and despair a reflection of the country's long uphill climb towards democracy. 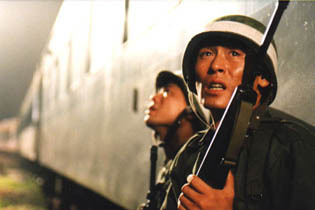 The most important turning point in the development of Yongho's character, when he accidentally shoots a student on her way home, is set against the backdrop of the Kwangju Massacre. This important landmark in the South Korean democratic movement, in which a clash between government troops and student pro-democracy demonstrators resulted in 200 dead (mostly civilians), was a specter that would haunt Korean politics for the next two decades, and ultimately result in the arrest and imprisonment of two former South Korean presidents. Furthermore, the Kwangju Massacre also triggered the rise of anti-American sentiment, as it was widely believed that the Reagan administration had strongly endorsed the use of force in quelling the riot. During much of the Eighties, we see Yongho's character being hardened by the brutal tactics employed by the police. Similarly, the Eighties were a turbulent period for South Korea under the leadership of General Chun Doo Hwan, whose iron-fisted regime kept the country in a state of martial law and blocked all efforts towards constitutional reform. Finally, in the Nineties, we see a battle-scarred Yongho initially riding the wave of economic expansion brought about by the new constitution of 1988, only to come crashing down during the economic crisis of 1997, when investors abandoned the debt-ridden South Korean economy, the currency rapidly depreciated, and the country was ravaged by soaring unemployment and bankruptcies. However, even if one does not have a passing knowledge of South Korean politics, "Peppermint Candy" is still a compelling film with its stirring portrayal of a man's disintegration. With his moving portrayal of Yongho, Sol exhibits tremendous dramatic range, from the film's opening scenes, as an unsympathetic and volatile boor, to the very end, as a poignant and tragic figure whose dreams will never come true. 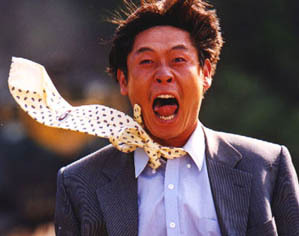 Given his unsavory introduction, as well as a number of scenes that underscore his volatility (such as how his temper ruins a celebratory get-together with friends), there is a constant threat of Yongho exploding in violence at any time, which adds an added level of tension to the film. Unfortunately, this cinematic gem has not seen wide distribution outside of South Korea, other than brief appearances at the Toronto International Film Festival, the London Film Festival, and the New York New Directors/New Films Festival. However, thanks to the advent of the Internet, "Peppermint Candy" is available through an import DVD, complete with English subtitles. Regardless of whether "Peppermint Candy" is viewed from a personal or political angle, there is little doubt that director Lee Chang Dong has created a modern masterpiece. With a judiciously-applied narrative structure and the brooding performance of Sol Kyung-gu, "Peppermint Candy" is a bittersweet confection that illustrates how the innocence and optimism of youth can end up crushed under the relentless march of time, the travails of happenstance, and the frailties of the human heart. Images courtesy of East Film. All rights reserved.